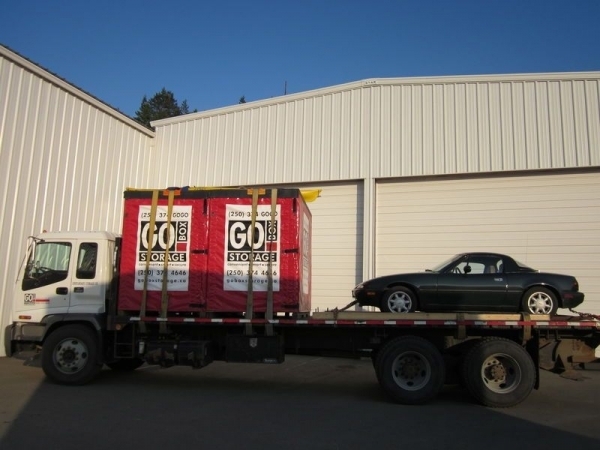 GO BOX Storage specializes in local storage and moving in the Kamloops area but we also do regional moves in BC and Alberta for our customers. If you want GO BOX Storage to handle your move, contact us for a moving quote. We also have yard storage for your RV, trailer, camper, car, truck, speedboat or sailboat. We have specialized warehouse storage for your motorcycle, quad, kayaks and canoes. Often people require something special for their moving and storage needs. A GOBOX may be great for many things but won't work for your kayak, canoe, extension ladder, church pew, vehicle or other oversized items. If you have something too big for a GOBOX that needs to be moved, please call us and we'll give you a quote. GO BOX Storage is experienced doing custom storage and moving -- just for you. This means we can usually accommodate your special needs. Every customer's storage and moving needs are unique. For example, this customer packed on her own schedule at her old home in Kamloops. When she was finished loading, she had GO BOX Storage pick-up and store her GOBOXES at our heated warehouse. The customer's GOBOXES were in storage for about two months while the customer made arrangements at her new location. When the customer relocated to Alberta, she got us to do a moving quote. She decided to have GO BOX Storage handle all her storage and moving needs. The customer had two GOBOXES, a sports car, and kayak to move. Because GO BOX Storage is doing a special move just for you, we can usually accommodate your special moving needs. When you move and store with GO BOX Storage you have choice. Another customer stored two GOBOXES with us for a number of months while they finalized a purchase of a new home on Vancouver Island. 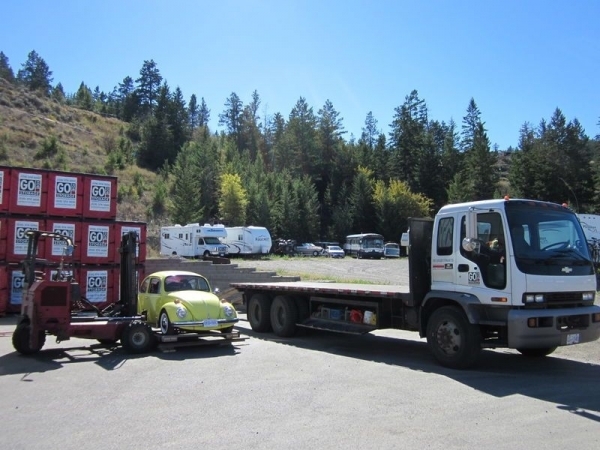 They also had a vintage VW Beetle they needed to get to Vancouver Island. 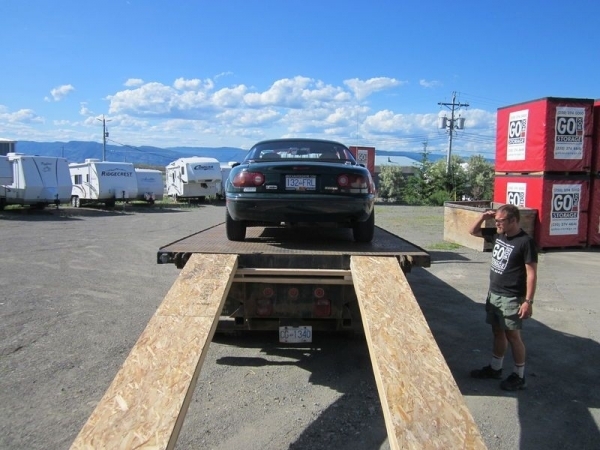 The customer was very anxious about moving this vehicle, safely! GO BOX Storage built a custom, moving tray for the vehicle so it could be loaded onto the truck for secure, transport and redelivery. The customer was VERY happy with how GO BOX Storage handled their precious car. 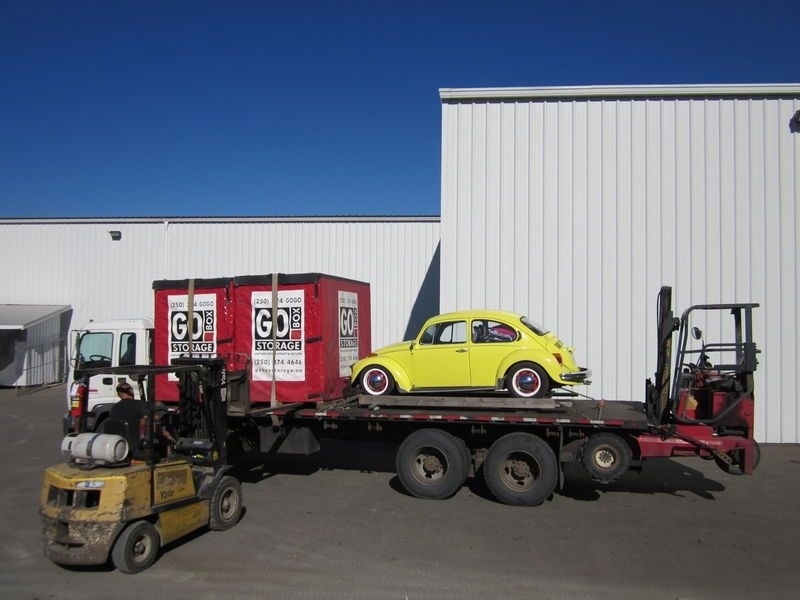 GO BOX Storage specializes in local storage and moving in the Kamloops area but we also do regional moves and assisted moves for our customers. If you decide that you don’t want to move yourself, GO BOX Storage can handle the whole move for you. Even if you have something very special you want moved -- give us a call! SOS TIP: If you just moved to a new place, and have just started a new job, and are too busy to move yourself, GO BOX Storage does regional moves in BC or Alberta. If you're behind on your packing, we can even pack up your stuff for you! Ask GO BOX Storage about the cost for assisted loading and professional packing supplies.